The cultivated cranberry, Vaccinium macrocarpon Ait., is a member of the Ericaceae or Heath family. Close relatives include the mossberry or small cranberry (V. oxycoccus), and lignonberry (V. vitis-idaea). The latter are wild-harvested and used for similar purposes as the cultivated cranberry. All are evergreen, creeping shrubs native to cool temperate or boreal areas. There are comparatively few cultivars of cranberry in production relative to other fruit crops, of which most are native selections or first generation crosses. Estimates of the total number of cultivars are as high as 130, but only about a dozen constitute 99% of the industry. ‘Ben Lear’, ‘Early Black’, ‘Howes’, ‘McFarlin’, and ‘Searles’ are the most popular cultivars derived from native selections. ‘Early Black’ is the leading Massachusetts cultivar that has high anthocyanin content and consequently good color, which is needed for making high quality juices and processed products. In Wisconsin, ‘Stevens’ (‘McFarlin’ x ‘Potter’) is a major cultivar giving reliable yields of large berries. 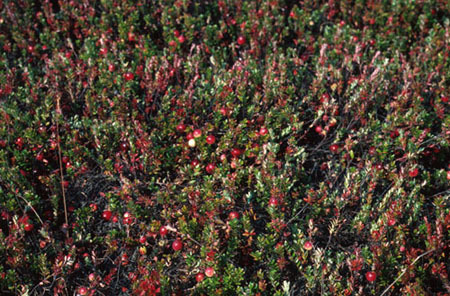 The cranberry is native to acidic bogs and peat wetlands of the northeastern US and southern Canada. It was long appreciated by native Americans, and fruit were collected since the English colonized the Massachusetts area in the 1600’s. Today’s industry has evolved slowly from manipulation of the plant in its ecological niche, the bogs, to increase yields, provide winter protection, and facilitate harvest. Similar to lowbush blueberry cultivation, cranberry production in Massachusetts first involved the management of native stands. This evolved into the building of ditches and dikes for water control, and eventually to the sophisticated artificial bogs used today. 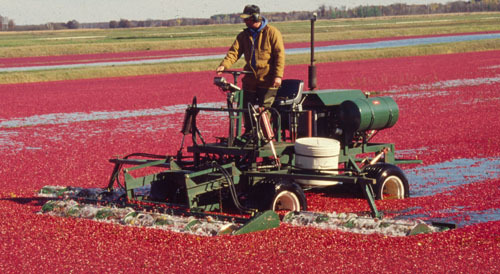 Cranberry production moved to Wisconsin in the 1860s, and later to New Jersey and Quebec, Canada. More recently, the Pacific Northwest has added a few thousand acres, but over 80% of production still remains in Wisconsin and Massachusetts. World (2004 FAO). 344,000 MT (757 million pounds). 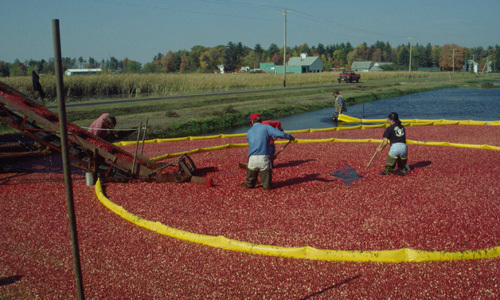 Production of cranberry is largely limited to the northern US and Canada. World area is about 73,000 acres, and yields average 10,400 lbs/acre. United States: (2004 USDA) 289,136 MT or 636 million lbs. Five states produce the entire crop (WI, MA, OR, NJ, WA) with Wisconsin and Massachusetts accounting for over 75% of the crop. Special thanks to Dr Teryl Roper, University of Wisconsin, and Dr. Michael Dirr, University of Georgia, for wonderful photographs. Cranberries are creeping, evergreen shrubs that spread by rhizomes, similar to their relatives lowbush blueberries. Upright shoots form from rhizomes after about 2 years, which produce the flowers and fruit. Uprights may grow 2-4 inches annually, with bases of the stems sagging down as the upright elongates – hence, only the terminal 5-8 inches remains in vertical position. Leaves are tiny (1/4 – ½” long), evergreen, thick, and oval/oblong in shape with entire margins. Leaves persist for 2 seasons, being shed in late summer of the year after development. Flowers are borne singly in leaf axils on the basal portion of a newly expanded, terminal mixed bud. Flowers are initiated the previous year. Flowering occurs over a 2-4 week period in late June to early July following bud break (Wisconsin), which is the latest blooming period of any temperate fruit crop. Flowers are inverted, have four petals, inferior ovaries, and are whitish pink in color. Cranberries are self-fruitful. Insect or wind disturbance is necessary for pollen release. The fruit is an epigynous or “false” berry. The fruit are bright red with waxy bloom at maturity, giving dark red to black appearance; color changes from green to white, then red during development. Fruit mature in 60-120 days after fertilization, depending on cultivar and weather. Soils – constructed bogs or wetlands, which have either peat moss or sand floors, pH 4-5, water used for winter protection, irrigation, and harvest. Every acre of cranberry bog has 3-10 acres of “support land” in the form of reservoirs, wetlands, and uplands that store or transport water to the bog. Cranberries are extremely flood tolerant when dormant; this is exploited for purposes of winter protection by flooding bogs from November-March. Climatic requirements -cool or cold temperate regions, chilling requirement is 600-700 hrs, with longer periods beneficial in reducing the time required for floral development. Buds and foliage are killed at -4 to -40 F. Winter desiccation occurs when the soil is frozen and environmental conditions favor transpirational water loss, such as cold, clear, windy days. Shoot cuttings are used as propagation material for new bogs. Upright shoots from an existing site are mowed, bundled, and sold by the ton for propagation material. The cuttings are simply spread over the surface and pushed into the sand with a blunt disc. Under good management, runners cover the surface by the end of the first season, and uprights are formed the second year. Full production occurs in about 4-7 years after propagation of a new bog. 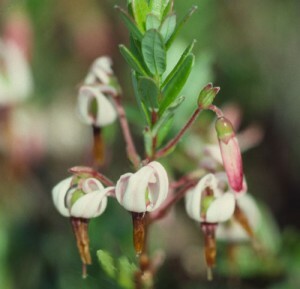 Planting Design – cranberry bogs are solid surfaces of plants, as vines spread naturally by rhizome and upright extension. Training and Pruning – none necessary, but occasionally uprights and runners must be thinned. Red color is the primary determinant of harvest maturity and fruit quality. Color increases over time, and harvest is delayed as long as possible to allow color development. Berries are harvested either dry or wet (‘on-the-flood’), with wet harvesting the predominant method. Dry harvesting consists of mechanical rakes which remove berries by a “hair-combing” like action. Wet harvesting involves flooding bogs with several inches of water, and beating the berries from the vines with water reels. Cranberries float on the surface, and are corralled into a corner, where they are lifted on a conveyor belt into bins destined for processing plants. Wet harvested berries must be dried before storage. Berries are cleaned and sorted by passing over sizing screens. Culling is performed by bouncing boards initially (good quality berries are resilient and bounce), and by hand afterwards. Berries for processing into juice are frozen in 100 lb barrels, and those for fresh market are packaged in poly bags and sold around the holidays. Frozen berries can be stored for several months. Fresh berries can be stored without refrigeration for a few weeks if marketed early. Fresh cranberries have a storage life of several months in refrigerated storage (40 F), unusually long for a small fruit crop. About 90-95% of the cranberry crop is processed into juices and sauces. Juice blends have become more popular in recent years. 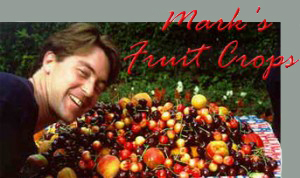 A small amount of fruit is marketed fresh around the Thanksgiving and Christmas holidays. A small portion of the crop is dried and used as a raisin substitute. The cran-raisins are used in muffins, scones, cookies, and breads. Per capita consumption of cranberries is only 0.2 lbs per year, with virtually all that as juice. *Percent of recommended daily allowance set by FDA, assuming a 154 lb male adult, 2700 calories per day.